If you missed the 24-hour screening of The Clock, you still have one more chance to see at least part of Christian Marclay’s mesmerizing montage—it is still screening during regular museum hours in the Art of the Americas Building, but only through Sunday. 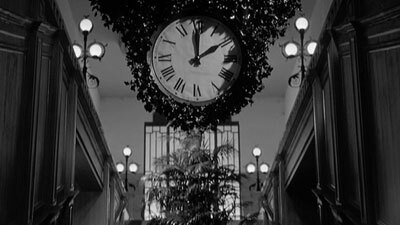 We hope to have another screening of The Clock in the future but for the time being, this weekend is your last chance to catch it. 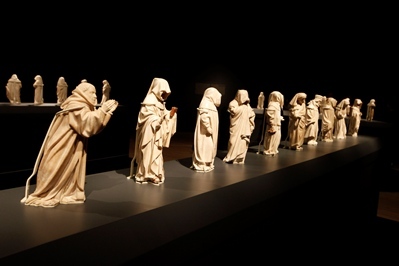 Also closing this week is the small but powerful exhibition of alabaster sculptures of the late Middle Ages, The Mourners: Tomb Sculptures from the Court of Burgundy. 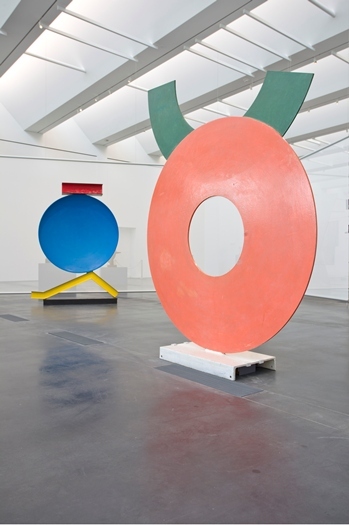 Walking among the arrangement of nearly forty sculptures encircling the gallery is an experience you won’t soon forget. 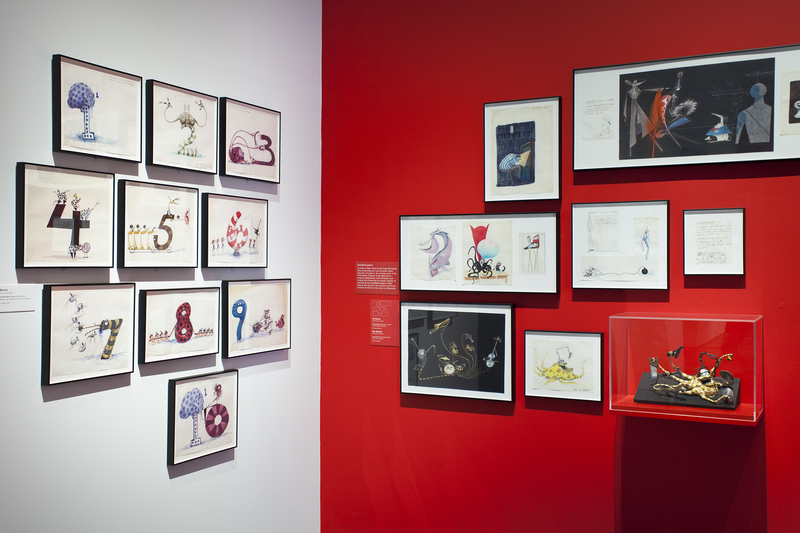 If you’re in the galleries tonight, whether seeing The Clock or Tim Burton or Jazz at LACMA, bring your kids into BCAM for some spooky (and silly) storytelling. As with every weekend there are a host of free concerts for you and your family to enjoy. Tonight for Jazz at LACMA, Kathleen Grace presents her blend of jazz and folk on stage in front of Urban Light. Tomorrow evening in Hancock Park, Edmar Casteneda brings an instrument you wouldn’t normally associate with Latin Sounds—the harp. And Sunday evening sees pianist Roger Wright performing works by Rachmaninoff, Ravel, and others for Sundays Live. The weekend at LACMA also includes its share of classic films. Tonight, Orson Welles’ noir The Lady from Shanghai, starring his ex-wife, Rita Hayworth, is paired with Bernardo Bertolluci’s foreboding The Conformist. Saturday, Jean Renoir’s beautifully filmed The River, based on a novel by Rumer Godden and taking place in India, is followed by Yasujiro Ozu’s quietly marvelous Late Autumn. Less quiet, but marvelous in its own way, is Saturday’s Monster Matinee—The Incredible Shrinking Man. Members, don’t forget—our Monster Matinees are free for you (and $5 for everyone else)! On Saturday we’re also pleased to be holding a terrific free event in Watts. 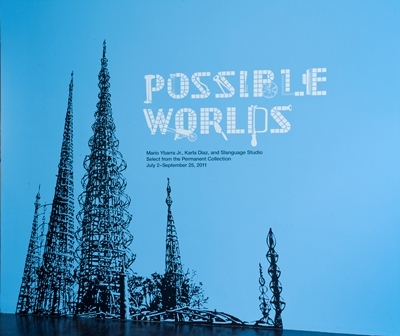 Artists Mario Ybarra Jr. and Karla Diaz of Slanguage Studio, who curated the current exhibition Possible Worlds, are collaborating with Watts House Project on the Garcia house across the street from Watts Towers. To celebrate both the collaboration and the exhibition, we’re having a free event at the Watts House Project site featuring art-making, poetry, and music provided by DJ Cheebo. No reservations are required, and you can either drive yourself there or come to LACMA and take a free round-trip shuttle (first come, first served). This Sunday is a fine time for you and your family to look at the glittering gold of Gifts of the Sultan and then take part in free art-making activities during Andell Family Sunday. Alternatively, musician Ry Cooder and artist Michael C. McMilien will be in the Art Catalogues bookstore reminiscing about the old days growing up in Santa Monica. The free event is a great chance to get a peek into the lives of young artists growing up Los Angeles. I can’t imagine there are many people who I could convince to spend 24 hours in a movie theater, and even fewer (myself included) who could stay awake for all that time—but I know someone who is going to try. Starting today at 5 pm and through tomorrow at 5 pm, LACMA will once again hold a free screening of Christian Marclay’s The Clock. Edited together from hundreds of clips of movies and television, the day-long montage is synchronized to local time and functions as a working timepiece with each clip featuring a clock, a watch, someone acknowledging the time, etc. This is a cinematic and artistic experience that 78-year-old Isabel Callahan does not intend to miss. After reading Kenneth Turan’s July 8th article in the Los Angeles Times, Isabel took his advice to heart and not only plans to check out The Clock, but plans to stay for the entire 24 hours. As the daughter of a Paramount Studios art director, Isabel has been interested in film since she was a child. In fact, she recalls spending many days in her childhood at a theater on Pico Boulevard paying a nickel to see a double feature. Hopefully those double features have helped prepare her for the day-long cinematic undertaking she is about to experience. Of course, Isabel isn’t too worried about the difficulty of 24 hours of staring at a screen. She does experience chronic pain, but that is one of only two concerns. Her only other worry is missing this opportunity. Isabel said to me, “I never want to regret anything the rest of my life.” (Based on what I’ve seen of The Clock, I’m sure it will live up to her expectations.) Like she said, if Christian Marclay put so much time and effort into this work, she’d like to honor his genius by devoting 24 hours of her own time, as well. Maybe she can take some advice from Sean Hathwell, who saw all 24 hours when we screened The Clock in May: “Wear comfortable clothes.” Sean, along with Christian Marclay, curator Christine Y. Kim, and others was interviewed by the public radio show Studio 360 about the experience of The Clock. Enjoy the all-day screening of The Clock (however much of it you can see) and best of luck to you, Isabel. I’m certainly pulling for you! Down at Watts Towers, a LACMA conservation team has been assessing Simon Rodia’s monument for several months. The team is working on an inventory of detached ornaments that have fallen from the Towers over time; securing loose or endangered elements; performing a thorough condition survey of the lower part of the monument; researching appropriate conservation materials, and monitoring cracks, to name just a few of their current activities. Part archaeology, part scientific inquiry, part artistic investigation, their meticulous work is fascinating to behold; they are getting to know the Towers inch by inch. Here’s a short video interview with senior scientist Frank Preusser and one of his team, Sylvia Dorsch, about one aspect of the work: the way they monitor cracks in the monument. If you’re thinking of visiting the Towers, join us in Watts this Saturday. LACMA, in conjunction with Slanguage Studios and Watts House Project, is hosting a party to celebrate Possible Worlds. Meet up there, or catch a free shuttle from LACMA, leaving from the BP Grand Entrance at 1 pm (no reservations, first-come basis). Make art, listen to poetry and music by DJ Cheebo, and enjoy this LA landmark. McQueen’s connection to Burton extends beyond this collection (aptly named Supercalifragilisticexpialidocious); Burton also created drawings for one of McQueen’s collections. As I further considered both artists though, it wasn’t difficult to draw even more parallels between the two. Both McQueen and Burton began creating works at an early age and attended schools to learn and train for their respective fields. Many are surprised to learn that Burton is a Burbank High School alumnus, and impressed to see the breadth of creativity during his youth. Both artists have achieved international acclaim for prolific careers established upon a recognizably unique form of expression—equally described as Gothic and romantic. They have each found inspiration in literary sources, including Edgar Allen Poe and the Brothers Grimm; McQueen stated that “life…is a bit of a Brothers Grimm fairy tale,” while Burton created a Japanese-themed twist on Grimm’s Hansel and Gretel for his first live-action production. 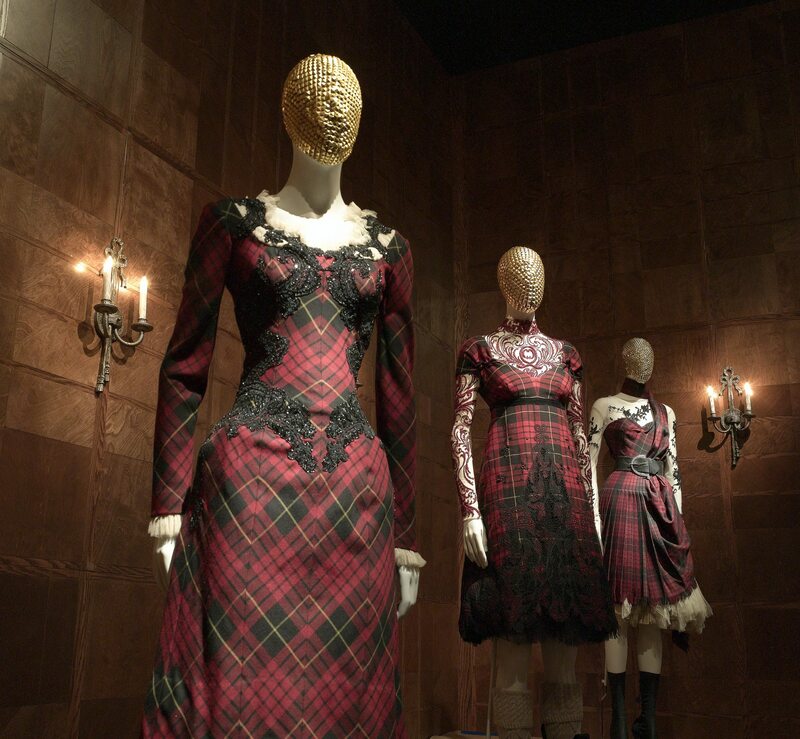 Each possesses a singular vision and aesthetic, though both Burton and McQueen have embraced storytelling in their work with narratives that are often autobiographical and/or inspired by the world around them. 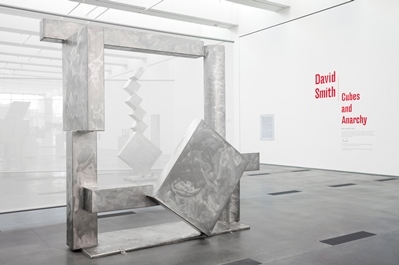 Sunday will be your last chance to see the steel sculptures of David Smith before they are packed up and moved out of the Resnick Pavilion. If you miss it, you’ll have to travel to Ohio in early 2012, when Cubes and Anarchy goes on view at the Wexner Center for the Arts. 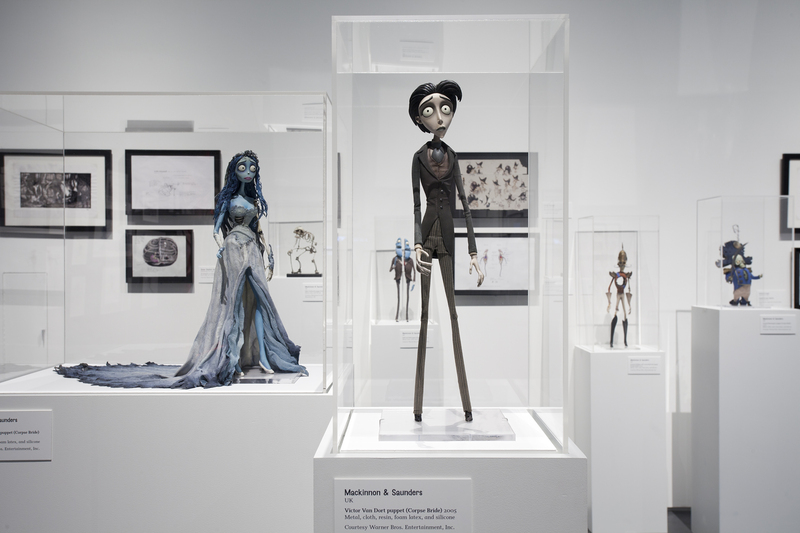 Tonight might be a great time to see the exhibition, since all of our galleries (excluding Tim Burton) are free after 5 pm for LA County residents. You also have your choice of concerts, films, and family activities all happening this evening. Bring the kids to hear stories of mystery and magic, or catch pianist John Beasley, whose last album was nominated for a Best Jazz Instrumental Album Grammy, performging for free during Jazz at LACMA. The “Celebrating Classic Cinema” film series continues with two films set in our very own city of Angels—Nicholas Ray’s In a Lonely Place, starring Humphrey Bogart, and Robert Altman’s The Long Goodbye. Tomorrow night sees Luis Buñuel’s The Exterminating Angel paired with David Lynch’s Mulholland Dr.
Saturday afternoon you can also catch a matinee screening of Journey to the Center of the Earth, part of Monster Matinee series. And as a thank-you to those of you who have joined LACMA, don’t forget that the matinees are free for members. Saturday evening, Bobby Matos and his Afro Latin Jazz Ensemble will give a free concert in Hancock Park as part of our free summertime Latin Sounds concert series. Next week will be your last chance to see the small but powerful exhibition The Mourners: Tomb Sculptures from the Courts of Burgundy. Whether you’ve seen it already or not, this Sunday is the perfect time to see it again. 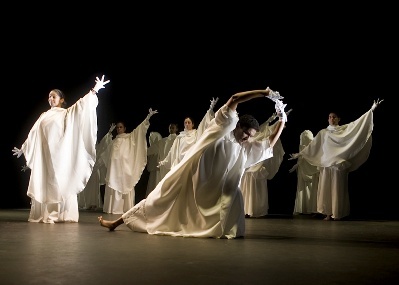 As mentioned earlier today, there will be a special—free!—dance performance by the Jamal Dance Theater inspired by the exhibition. Finally, the weekend at LACMA comes to a conclusion with a free concert by iPalpiti Artists, who will perform works by Mahler and Schubert during the free Sundays Live concert series. 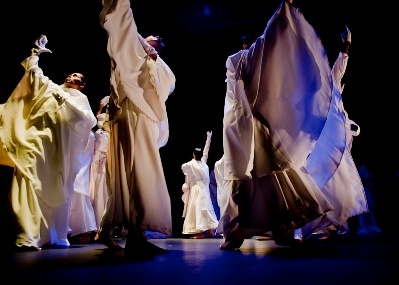 This Sunday, award-winning choreographer Jamal and his performing ensemble, Jamal Dance Theater, will present a second performance of “Mourners Are Dancing Too,” a piece which was specially commissioned by LACMA in connection with the exhibition The Mourners: Tomb Sculptures from the Court of Burgundy, which closes next weekend. The subject of the dance was inspired by an episode in the history of the mourners: the disappearance of some of the sculptures during the French Revolution and their replacement in the nineteenth century by statuettes bearing the features of the sculptor and architect who took on the project of rebuilding the tombs of the Duke of Burgundy. This is the second time during the exhibition’s run that Jamal is staging this performance. 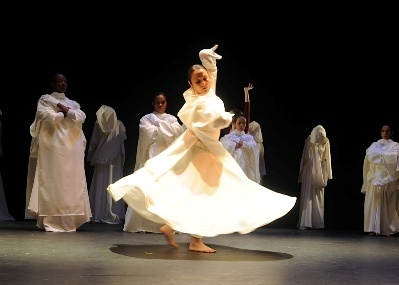 Jamal’s choreography—and exactingly reproduced costumes—suggest through movements accompanied by the original music of famed Persian composer Ahmad Pejman the emotional power of the sculptures. Both whimsical and serious, this beautiful performance is not to be missed! In Smith’s passionate hands the noble savage is the working man. It was the 1930s, and workers’ rights was the air you breathed. 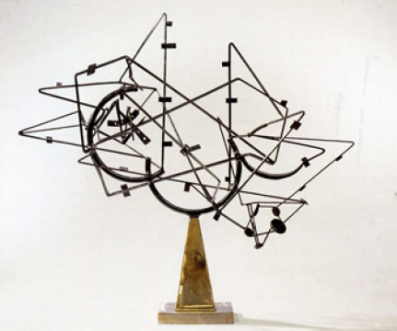 His crucible would be the Studebaker factory floor; a “eureka” moment of seeing Pablo Picasso and Julio González’s collaborative iron constructions in a 1931 issue of Cahiers d’ Art; and reinforced in the Russian Constructivism of Rodchenko and Malevich and Tatlin, which blurred the distinctions between art and manufacturing. Within these parameters, Smith is the rebel artist with geometric vision, the soul of a poet and the heart of a working stiff. He defiantly favored Karl Marx as a subject matter. And to this end (possibly romantically), he was a card-carrying member of United Steelworkers Union of America, local 2054, straddling what could be an existential divide of his aesthete’s ambitious dreams and energies. Lifting steel into space as none other, his geometry would float off the page of his drawings and photo montages, the steel relieved of its weight. Spending time with it in the gallery, I witnessed the lyrical dance in the space of Star Cage, where sculpture fuses into tensile rods and geometry is isolated in its negative areas. 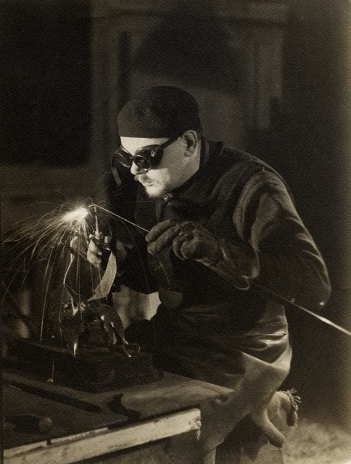 Also found in the exhibition catalogue, Anne M. Wagner’s “Heavy Metal” essay puts forth that “…welding and metal were synonymous with modernity…” and she characterizes Smith as “the twentieth-century prosthetic god,” as he was fully dressed in welder’s regalia. 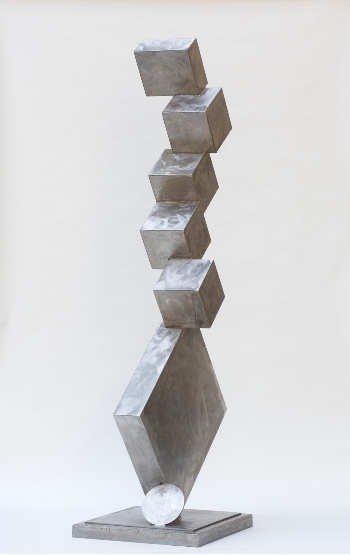 Smith’s Hero sculpture, maybe inspired by Constantin Brancusi’s Bird in Space except for the base and the head, offers none of the solidity in its spare, extraordinary lightness, as if a man was simply brushed in air. In spite of the angles, the volume, the defying “gravity,” as Clement Greenberg would say, there is certainly a sort of imposed melodrama about the work, placating the ghost of Roman power and parables of the plowshares and the swords which creeps around his title. Anthropomorphic touchstones tied to some visceral need to stay grounded, knowing secretly that the steel had its own life. I can sense his homage to Mondrian as the bright, playful and daftly humorous circle and rectangle steel pieces of yellow, blue, and red in Bec-Dida Day and the orange of Circle III, sends mixed messages of artful logic and cosmic radiance. Smith was a confessed painter using a different canvas. 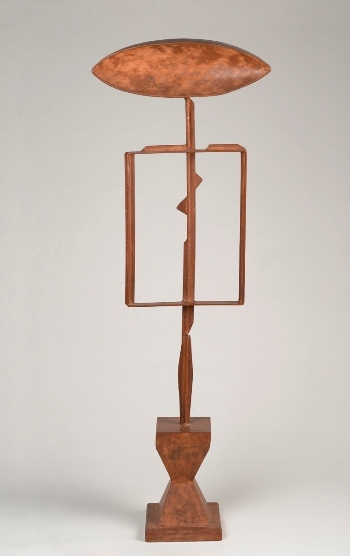 His last balancing act was the baroque boldness of his Cubis, their weight and power dispelled through with deep burnished “gestural” swirls, an abstract expressionist act, giving the surface an eerie transparence, the sculptures’ mass almost mimicking a human presence. The man of steel claimed earlier, “I would prefer my assemblage to be the savage idols of basic patterns,” for even in the delicate surface there is still something savage, which he prefers to place against nature, though nonetheless triumphant, and a wonder. And we too are in wonder at the enterprise that guides us, willingly, through the last great conversation of modern art in this very human adventure. You are currently browsing the Unframed The LACMA Blog blog archives for July, 2011.